Honestly, it surprised me. It surprised me more than I thought I was going to, but in a really good way. As we know, Disney has been making a lot of live-action remakes in recent years, and some have been great, giving us interesting new slants on familiar stories - I'm thinking likes of 'Maleficent' here - while others have been carbon copies of the animation, which is pretty and nostalgic, but some of these films really need updating for modern times - think 'Cinderella'. 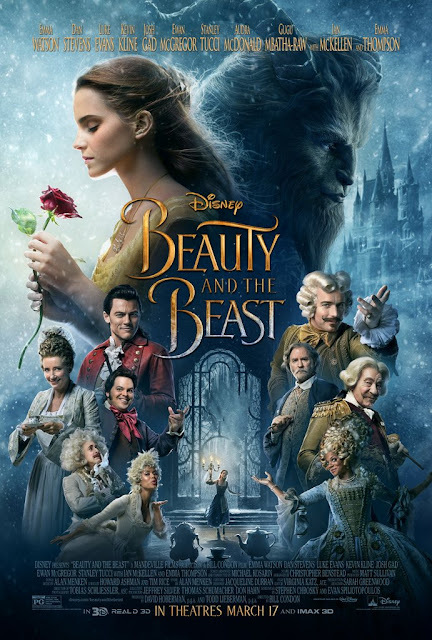 Beauty & the Beast managed to find a pretty good middle ground, giving us everything we all loved about the original animation, while making sure it appealed to our modern sensibilities (as much as something set in the 18th century can). Obviously there are certain aspects of this classic, fairytale story that can't be changed, but with a two hour long feature film, there were new details and character histories introduced to make everything feel a bit fuller and richer - I particularly enjoyed the glimpses and recounts of the Beast's life prior to the curse, which explain how he came to be who he is. The familiar themes of love, family, seeing beyond physical appearances, and the desire for adventure were all still present (there's a nice little detail which can help satisfy Belle's longing for adventure and travel, giving her a happy ending that goes beyond marriage! ), but I especially enjoyed the theme of outsiders running through the story. The Beast is obviously one, and the character of Agatha is definitely an interesting addition, but I especially liked how Belle's isolation was emphasised - we already know she's a bit different to the rest of the town, but it's even more played-up in this version, which makes her and the Beast coming together an even happier, more satisfactory ending, as they both have a clear longing for companionship. Yes, there are critiques to be made about the plot - a girl falling in love with her beastly captor? - but that is true of most fairy tales and their adaptations, yet these are stories that have endured for hundreds of years. And all stories need to be examined in context and carefully considered; they are not all written for us to follow their example or assume everything in them is right! I think we all knew Emma Watson would be the perfect Belle, clever and brave, with a good heart who knows what really matters - and her singing, although not dazzling, was very pleasant to listen to! I very much enjoyed the portrayal of the Beast, especially given that Dan Stevens's real self is only on screen for a few minutes, yet the Beast's humanity shines through his outer appearance, and I found this version of him to be far more nuanced and emotional than the animation. The host of supporting characters inside the castle are all as delightful and endearing as we'd hoped, and even they got some embellishments to their stories - the one about Mrs Potts (Emma Thompson) and Chip (Nathan Mack) at the end nearly had me in tears! Although no one has explained to me yet why Lumière (Ewan McGregor) and Plumette (Gugu Mbatha-Raw) - both very charming and entertaining - are the only characters with French accents, when the whole film is set in France? Surely either everyone or no one should have accents? Oh well! Ian McKellen is also the perfect voice for the stoic, loyal, obedient Cogsworth. Maurice (Kevin Kline), Belle's father, also became one of my favourite characters in this, with more screen time than I'd anticipated, and he is the most kind, caring, loving character. Even Gaston (Luke Evans), who is as villainous as ever, felt like a more fleshed out and richer character, and of course, LeFou is delightful - how could he not be, when portrayed by Josh Gad? All the songs from the original film are included, as well as some new ones. I wouldn't say the additions were as memorable as the originals, but they definitely tugged on the heartstrings a bit more than I remember the animation doing, especially the Beast's solo 'Evermore' near the end! I was aware that John Legend and Ariana Grande has recorded a version of 'Beauty and the Beast', which I've yet to listen to, but I was very glad that that scene kept Mrs Potts (Emma Thompson) as the singer. The entire soundtrack is beautiful though, with the score written by the incomparable Alan Menken, who is responsible for the vast majority of my favourite Disney songs and scores. The film really shines with its music, but also with its animation, the visual effects that bring so many of the characters and settings to life. It is absolutely beautiful throughout, from the eerie towers of the Beast's castle, the French countryside, the host of animated furniture, the magical effects - and yes, that ballroom scene was as stunning as we could have hoped for. The music and visuals were really what made the film for me - I was swept up in the magic and the nostalgia, as it gave me everything I want and expect a Disney fairy tale film to be! Was it perfect? No, there will always be criticism. Yes, the original story has troubling components. Yes, Belle's happy ending does involve marriage to a prince (though as mentioned, there's the option for her to travel still, and more addressing of her desire to feel understood). Yes, there could be better representation - the much talked about gay moment is fleeting, and the interracial couples are only in their human forms for mere minutes. But overall, I really enjoyed it. It had everything I loved about the animation as a child, especially through the stunning music and visuals, and Belle was always one of the princesses I related to the most, but with some important updates and new details to give us richer characters and hopefully a better understanding of them. It definitely tugged on the heartstrings many times, even though I knew the ending already, and it's not often I get emotional at films. It was everything I could have wanted from a classic film, and I left the cinema feeling very happy, emotional and nostalgic.